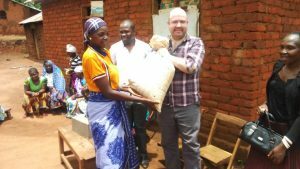 OUR HEAD OF FUNDRAISING, RONAN MCCAY SHARES HIS EXPERIENCE OF A RECENT TRIP TO TANZANIA TO VISIT OUR INTERNATIONAL PROJECTS. IN PART 3 OF THE TANZANIA DIARY, RONAN VISITS NDOLE AND KINDA. This morning’s roll-call: Joseph, Chiku and Frank from our Tanzania team; photographer Chris; Godfrey from our partner organisation, the Childhood Development Organisation; Pelice, an education officer from the local council; and me. An important aside at this point: I don’t need to understand Swahili to appreciate how warm and welcoming Tanzanian people are. Rarely more than a couple of minutes away from beaming smiles and booming laughter, they really are a pleasure to be with. Today will be different for a couple of reasons. It’s Saturday so we won’t be meeting any children at school. And, rather than taking in projects that are currently active we’re visiting two villages that have benefited from our support in the recent past. This is significant because we place great emphasis on developing programmes that will be self-sustaining in the long-term. Empowerment through partnership is our goal and I’m looking forward to hearing about progress made. Joseph is a skilled and patient driver. As we bump our way along crater-riven dirt tracks he needs to be. 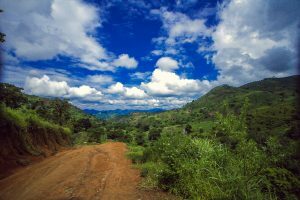 It’s a long journey to Morogoro’s Kinda ward and even getting there is a challenge in itself, but the scenery en route is genuinely breath-taking. Someone painted Children in Crossfire’s logo – quite some time ago, clearly – on the outer wall of the school in Ndole. Its interlocking hands have never resonated more for me than they do in this simple drawing. School and village leaders show us around. A water pump has been installed. New classrooms are well underway. And up on the hill overlooking it all is the Early Childhood Development centre we helped to build. It’s such a simple facility but it’s so vital in this community. 95 children from all over the surrounding area use it every day. 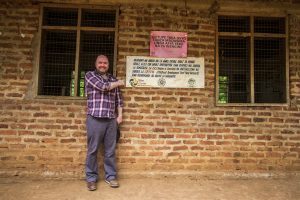 That’s far too many for this small building and just one teacher, but it’s at the heart of Ndole and in it thousands of young lives have been set on a positive path. Long may that continue. Onwards – and literally upwards – we go. 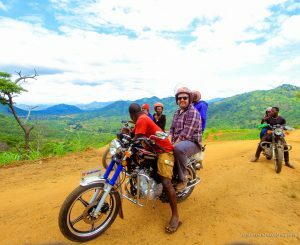 Kinda village is at the summit of a mountain, so it’s motorbikes only along a steep path from Ndole. About two-thirds the way up we stop to take a look back over the long valley below us. This is one of the most beautiful sights I’ve ever seen. I hope the photos accompanying this piece do it justice. Kinda village is pristine and its people are clearly – and understandably – very proud of where they live. Again we’re greeted with great warmth as we sign the visitors’ book. The local leaders thank Children in Crossfire for our support and I thank them for their kind welcome. We walk about ten minutes across fields of maize – pretty much everything eaten here is grown here – to meet with the women’s group and discuss the impact of their Community Managed Micro-Finance initiative. 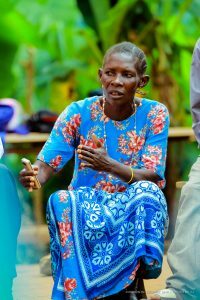 This is a fund that allocates small, short-term loans to villagers to enable them to, for example, rent some farm-land to grow crops, buy utensils to allow them to cook and sell food or make soap. 10% from this fund is invested in the school, helping to ensure it can always meet local children’s needs. It’s a wonderful co-operative that fosters community spirit and bolsters educational opportunity. After a long meeting under the now roasting hot early afternoon sun, we get ready to bid farewell. Good work has been done by our team, Godfrey, Pelice and the villagers. Action points have been agreed and will be followed up on. In a very touching gesture, I’m presented with a large bag of beans as a sign of Kinda’s gratitude to Children in Crossfire’s supporters. My colleague Frank suggests that I donate it forward to the school, where it will be put to best use providing breakfast for the kids. It will go a long way there. And it’s a long way back to Morogoro town from here but today has been very special. Simba Sports Club, one of Tanzania’s two major soccer clubs, are staying in our hotel. As I set myself up for Sunday with pancakes, bananas and as much coffee I can guzzle, some of my colleagues and hotel staff are getting selfies with the players. Football is clearly a big deal here, especially the English Premier League. So far on my travels I’ve noticed hundreds of Manchester United, Chelsea and Arsenal shirts but next to no Liverpool, proving that bad taste knows no boundaries. Four hours more and we’re back in the dead city heat of Dar. Along the side of the roads here people vie for space to sell whatever wares they have to slow-passing drivers or their passengers. Lock nuts. Peanuts. Fruit. Ice-cream. Keyrings. Cups. Footballs. Toys. Rubik’s cubes. Road signs. Machete knives (yes, really!) Everything has a price and negotiations are fast before the traffic moves on. Honestly, I find the street vendors very pushy – it’s distressing to see them standing at your window, pleading for a sale. I suppose if feeding my family depended on the day’s trading I’d be pushy too. Joseph drops me to the airport where I meet with Heri, Frank and Davis (who was facilitating the teacher training in Morogoro all week) for our evening flight to the city of Mwanza, on the banks on Lake Victoria. Yesterday’s journey to a mountaintop brought us to far-flung extremes, but tomorrow’s jaunt to Ukerewe Island will put even that in the shade. ‘Making a difference’ is something of a catch-all term that can mean so much or so little, but in Kinda and Ndole it’s very clear that Children in Crossfire has made a real and lasting difference. Children in Crossfire goes to great lengths to help little children, and that makes me very, very proud.